Brace yourselves for the Blood Eternal pokie from Betsoft. Online pokies have long been inspired by different stories, this here delves into the world of Vampires. Set in a medieval castle, this is a fiendishly exciting pokie to play. Spin the reels into a dimension where humans, alive and dead, cowboys and vampires come together to entertain and maybe scare you a little. Blood Eternal ups the game a bit with not five, but six reels and 30 paylines. Set against a dark haunting moonlit background with candles. The graphics and moody soundtrack definitely lends a foreboding atmosphere. Symbols include stand card suits, J; Q; K; A which are the lower value symbols. Bats, castles, a bottle of Holy water, vials of blood and crosses are among the other pokie symbols. The Wild symbol is written in old English calligraphy against a blood red background. It can substitute for all other symbols, save for humans and vampires, to form winning combinations. Players have the chance to land a massive jackpot with the bat symbol. Bats, especially double bat symbols, have the potential to multiply wins up to 1000x when 12 bats appear on the reels. Free spins can be triggered when humans and vampires appear next to each other on the reels. Eight free spins are earned when the human is caught, and as vampire-human interactions go, the human is bitten on the neck. This visual freezes on the reels to become a wild and help in forming more winning combinations. Free spins can be re-triggered given that there is another vamp-human combination in the free spins round. Bear in mind vampires only appear on the second and fifth reels while humans are on three and four. There is a Blood Eternal bonus round where players have the opportunity to double their winnings in a dicey heads or tails guessing gamble. The bonus can double your huge real money wins, however players must be cautious because they can easily lose it all. 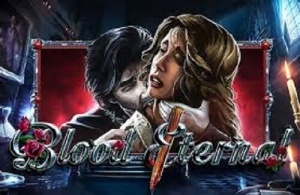 Blood Eternal is a uniquely themed slot. The design, graphics, sound effects are well executed. The jackpot within the game is a big draw on its own. The additional bonus features that award free spins and double wins make this pokie a must play.